If you’re looking for a comprehensive guide on how to clip-in hair extensions, you’ve come to the right place. It’s common for a lot of girls and women to get nervous or unsure when it comes to hair extensions because not a lot of people are familiar with them. But after reading this post, you will see for yourself how truly easy it is to transform your hair into long, voluminous locks in just minutes, without any damage to your hair. Let’s get started. 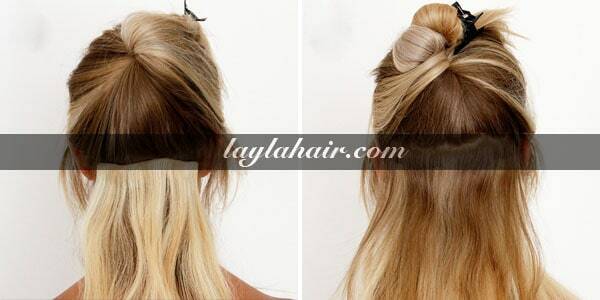 One of the best features about Layla Hair clip-in hair extensions is the super sturdy and secure clip. All you have to do is click to open and click back to close. With the clip in hair extensions, there is no commitment as there is with other types of hair extensions that are taped, bonded, or glued to the hair – you can clip them in and out whenever you like. Isn’t that good? Whenever you feel like it. 1 Take a 3 clip weft. Start off by brushing your own hair thoroughly using a soft paddle brush to get rid of any tangles. Separate a straight thin section of hair with your finger or a comb at the nape of your neck and clip the rest of your hair away by using a hair clip. Take a 3 clip weft. Secondly, brush it out before clipping it into your hair. Start from the bottom and work your way up the weft, using a soft paddle brush. Measure the weft against your head to ensure its size will fit perfectly into the sectioned hair. Next, find the center of your head and clip in the middle clip into the roots of your hair. Be sure to clip as close to the roots as possible. To make it easier and to prevent the clip from sliding down too far, try pulling that section slightly away from your scalp to have some leverage, or simply tease it to create a more secure base. Once the middle clip has been clipped in, clip the left side and then the right. In addition, separate a straight thin section of hair above the first clipped weft, and clip the rest of the hair away with a hair clip. Take the smaller 4 clip weft. Brush it from the bottom up to make sure there aren’t any knots. Measure the weft against the sectioned portion to make sure it will fit perfectly on your head. Moreover, find the center of your head and clip in the middle two clips into the roots of your hair first, and then follow by clipping in the side clips. Make sure there are no bumps in the weft by slightly stretching the weft to the sides when you’re clipping in the middle clips. Furthermore, separate a straight thin section of hair from ear to ear right above the second clip in the weft, and clip away the rest of the hair. Take the largest 4 clip weft. Brush it out and measure it against your head to make sure it fits. Clip in the middle two clips in the middle of the sectioned hair and continue by clipping in the side clips. Besides, separate a straight thin section of hair about two inches below the crown of your head and clip the rest of the hair away with a clip. Take the second 3 clip weft. As usual, brush it out carefully and measure against your head to make sure it will fit perfectly. Find the center of your head and clip in the middle clip into the roots of your hair first, followed by the side clips. Now, all the large wefts at the back of your head have been clipped in, and only small ones should be left. Last but not least, these are the wefts that go on the sides of your hair: there are two 2 clip wefts, and four 1 clip wefts. They will add volume on the sides and make everything blend in more seamlessly. Separate a straight thin section of hair about two inches above the ear on the side, and clip the rest of the hair away. Take a 2 clip weft and secure it closest to your hairline first. Then secure the second clip closer to the back of your head. Then, separate a section of hair right above the 2 clip weft and clip the rest of the hair away. Brush out two 1 clip wefts and clip them in onto a small piece of hair as close to the roots as possible, above the 2 clip weft, anywhere where you feel you need more hair. Repeat the exact same process on the other side of your head. Brush your hair and check in the mirror to make sure that all the wefts are hidden, especially in the back. And that’s it! Remember, just like anything else, it will take a little bit of time to practice.